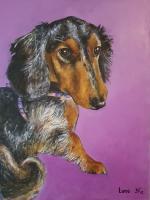 You can paint a portrait of your pet or favorite animal. I teach a class that shows you step by step how I paint. Attend scheduled classes or we can organize a class for your group. Contact me to discuss a portrait of your pet or favorite animal. I work from photographs. If possible, I like to meet the subject before painting her/him.